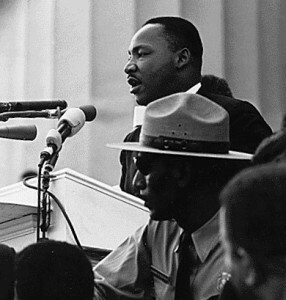 When we look at the words, the beautiful, poetic words Dr. King left us, we see a theme emerge — whether he is marching for equality on the Birmingham bus, or rallying against segregation, or supporting a strike for sanitation workers — the greatest enemy of change is complacency. The full text of the “Letter from Birmingham Jail” makes this clear, and should be read by anyone engaged in social change. If we want to see change in the world, we cannot wait for someone else to act. We cannot sit back and pray someone else will open their mouth and voice our thoughts, advocate our hope. Our responsibility to ourselves and our communities implies a commitment to act, to speak, to do better and be better. Looking over a world that consumes more than it produces, that ignores the signals that nature is out of balance, and prejudices short-sighted comfort over long-term sustainability, we are responsible for our reaction. If, instead of speaking out and acting out, we are waiting for someone else to do something, then we are the good people of appalling silence. The appalling silence Dr. King describes is complete, a silence of mute tongues and still hands. The appalling silence accepts the terrible noise of injustice as immutable. Appalling silence whispers, “This challenge is too great, for me” – and it is right, but no challenge is too great for “us.” And we cannot know you are one of us if you are silent, if you are still, if you are complacent with what you know is wrong. We cannot pretend to know the heart of Dr. King, or what he would say about consumer culture, or global warming — these are the issues of our day that we must confront. What we can glean from the wisdom of Dr. King, on this holiday set aside to celebrate his life, is the importance of conscious action, the willful and intentional application of voice and body in the pursuit of a better world.